Recently the Steampunks of Brisbane were interviewed by Michael Lund of the Courier Mail regarding, well, Steampunk. Entitled "Letting off steam", the article paints quite a good picture of the Steampunk subculture's life in the city and has a number of stop-off points to find out more. One of them is this very site, so to further your Steampunkian education I've collated as much as I can of my Steampunk-related bookmarks into this post. There may be a test. The people who inspire me when I look into steampunk, who are well worth a follow; also individual articles on steampunk that are a good read. Doctor Fantastique's Show of Wonders: Fingers (and other appendages) on the pulse of Steampunk; reporting all over the world. Disclaimer: I'm the chief Australian correspondent, so I may be biased. I'm not though, and it's that good. Silver Goggles: Written by an excellent writer who delves into the multicultural steampunk implications. Steampunk was coined as a genre around the 1980s, but works that support the steampunk ideal were around well before that. Many of the works by Jules Verne and H.G. Wells can be found for free, legal download from eBook repositories. Arcadia Snips and the Steamwork Consortium » IN WHICH A STREET REQUIRES CLEANING: A book that was released a chapter a Monday. Now fully up for download. Steampunk Magazine - free to download! Steampunk tales for your iPhone: Exciting this, the President of Steampulp Publishing contacted us directly to promote this eMagazine for the iPhone. Billed as the "Penny Dreadful for your iPhone", it's now up to issue 9 as of Apr 2011. League of Extra-ordinary Gentlemen: A little more adult than most people expect from a comic book (the Invisible Man introduction was quite confronting, as if the acquisition of Quartermain wasn't enough), regardless of your opinion of the movie this does delve into a distopian vision of steampunk. Gail Carriger: Parasol Protectorate series. Werewolves, vampires, parasols and Victorian England. Gail's take on a supernatural steampunk includes a new breed of supernatural rather than just co-opting the well known, parascience also makes a grand entrance. Book four is due 2011. 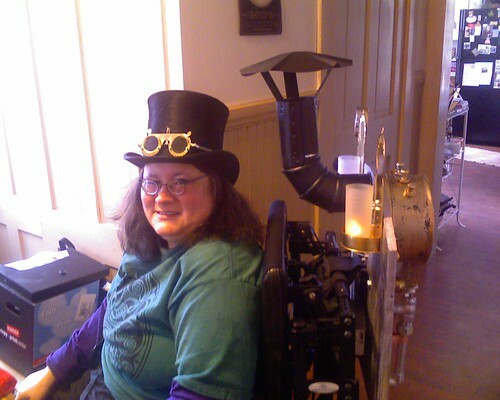 Gail also has a specific page on her site with her views on steampunk. H.G. Wells at Project Gutenberg: The First Men in the Moon, The Island of Dr Moreau, The Time Machine. More ubiquitous speculative fiction that has mirrored modern advancements. Well, we haven't revealed the time machine yet due to patenting issues. The Difference Engine: Written by William Gibson and Bruce Sterling, it's described as a prime example of the steampunk sub-genre. Modern-esque devices wrapped in Industrial Revolution technology, hackers (clackers in this parlance) trying to break into the mass produced difference engines. It is a complete alternate history sparking off from our own but with parallels of events/ technology. Jules Verne at Project Gutenberg: 20,000 Leagues Under The Sea, From the Earth to the Moon, Paris in the 20th Century. These books were written before the turn of the 20th century and predicted submarines, rocket ships, air-conditioning - many modern technologies. The overarching technology aesthetic remained Victorian in style, a driving force behind modern Steampunk. Girl Genius Online Comics! : By Phil and Kaja Foglio, the comics follow Agatha Heterodyne through an alternate Europe where "the industrial revolution became an all-out war". Dirigibles, utterly bonkers science, constructs and clanks. Most of ROSEA swear by their goggles that their store is marvelous – not just because most of ROSEA got their goggles originally from said store. League of Extraordinary Gentlemen: Almost nothing like the comic, but that's why these are movie adaptions rather than direct clones. The Nautilus is tres steamy. And you cannot go wrong with dirigibles. Well, not without trying hard. The Time Machine: Say what you will about movies not following plots, but that is one delicious looking time machine. Watch the DVD extras for more shots of it. Baron Munchausen: While quite a bit earlier than the generally accepted steampunk era (being the reign of Queen Victoria), the clockwork bird, hot air balloon and musical instrument of the Grand Turk have airs of the technology. And I'm quite taken by the whole tall tales factor. Doctor Who, "The Next Doctor" 2008 Christmas Special: The Doctor has generally had an aura of steampunk – fixing his own technology (occasionally using the ancient technique of percussive maintenance) – but this time the Cybermen get involved. Steam will out, after all. Doctor Who, "The Girl in the Fireplace": Clockwork bad guys, Madame de Pompadour. The Doctor rides a horse. Delightful. This section presents a number of sites with steampunk examples, advice, and items for purchase. Hugh Casey Photography : Events: Great professional shots of a Steampunk/ Neo-Victorian event that is monthly! Updates frequently. Historical fashion timeline on Flickr - Photo Sharing! Steampunk tales for your iPhone: Exciting this, the President of Steampulp Publishing contacted us directly to promote this eMagazine for the iPhone. Interface is a wee bit clunky, but the stories are quite good and the cover art is neat. Most of the games and applications will be based on my own experience and platforms (OS X, PS3, Wii, Win), but I'm always open to suggestions. Machination by Signal Flare Games: An iOS game of building robots as an evil genius. Was a Kickstarter project, so it was crowd-funded. Cheyenne Wright of Girl Genius colorist fame (Hugo award winning!) is behind the art of the game. Snark Busters: Welcome to the Club | Alawar Entertainment: A bit of hunt-and-click combined with an inventory combination system. Harkening back to the classic adventure games, with an entertaining storyline to go with it. Mr B. - Gentleman Rhymer: For those who like diction with their rap addiction. Professor Elemental: He even has a song called "Steam Powered" specifically about steampunk. His "Cup of Brown Joy" song all about tea was the first truly steampunk song I heard. Abney Park: I lose my license if I don't mention these guys. We've submitted some videos to their "Help make our music video" thing; wish us luck! Clockwork Quartet: Not only are their topics Victorian steampunkian, but they have Steampunk characters and their first two songs are about clockwork and science - with the talent to include clock-ticks and scientific note-taking as musical instruments. Sunday Driver: World music, with Indian overtones but steampunk sentiments. The Clockwork Dolls: Instrumental music with feeling. As they say, great soundtrack to happenings. FeyblesNel's Etsy Store: I know this lady and she does great work. Boiling pens, hand boilers, love meter. : Something to fiddle with during long meetings? An item to play with while brainstorming? Hold the pen and it appears to boil. A fun pen! Euchronia: 2008-2009 was the premier event of the Steampunk New Years Eve ball in Melbourne. You can purchase membership that also gets you a lovely gold or silver pocket watch.